In Senegal, an overwhelming majority has a positive opinion of the U.S.
As President Obama kicks off a three-country tour of Africa in Senegal’s capital city Dakar on Wednesday, new data from the Pew Research Center show that both the U.S. and its president are very popular in this predominantly Muslim West African nation. 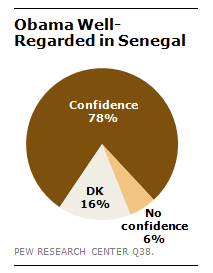 Overall, 81% in Senegal have a positive opinion of the U.S. This is consistent with the high ratings for the U.S. in sub-Saharan Africa registered in previous surveys. It also marks robust support from a country with a population that is almost entirely Muslim. Additionally, more than three-quarters of Senegalese (78%) express confidence in Obama’s ability to handle international affairs. After visiting Senegal, Obama is expected to head to South Africa and Tanzania, before returning to U.S. soil. The visit comes during a time of increased economic prospects for Africa. According to IMF estimates, the economies of sub-Saharan Africa grew by 4.8% in 2012, with Senegal enjoying 3.5% growth. Nearly half of Senegalese (48%) are satisfied with economic conditions in their country and 69% think their economy will improve in the next year (For more see, Economies of Emerging Markets Better Rated During Difficult Times).